The number of Micro-blogging sites is available today to provide you with the opportunity to earn money online. One of them is Twitter. Today I share ‘how to earn money online with old twitter account’. Here you can earn money from your twitter followers. Make Money Online By Twitter Followers. Twitter is a famous Micro-blogging site in the world and the number of internet users is its member. 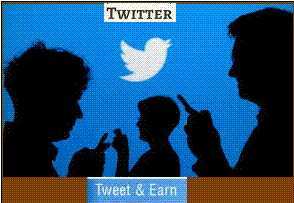 A user can earn money online through his twitter account and tweets. The number of websites provides the facility of tweets. Recently USA president Donald Trump Twitter account was in limelight. Ad Dynamo is one of the platforms, which provide the facility of tweets to those users, whose Twitter account holds 100 followers. Basically, this website pays you on the efficiency and effeteness of Tweets. How to make money on Twitter sponsored tweets and what is the process to Sign-Up on Ad Dynamo for the account? If you did not have the account on Ad Dynamo, you will have to visit on site www.addynamo.com to open the account. You will have to submit your e-mail address, twitter handle or account information after Sign-Up. You will receive information when sign-in your account on Twitter. The company will provide information about endorsed tweets. Which brands product you have to promote? Users will write tweets about endorsed product promotion as he wants and will submit it. Now website decides – tweet write or wrong for promotion. How to get the amount on my tweets? If you have earned money through the website, you can get the amount directly in your account. But the minimum threshold is $20 (approx- Rs. 1350/-). The user can get the facility to add its account with the website when reaching the minimum threshold. What is the basic Introduction of Ad Dynamo? It’s a twitter exclusive ad sales partner in Africa. This site supports brands in leveraging Twitter to the fullest. Provide assistance to the African market to promote products online with the best technology to compete with the worldwide market. The company knows the power of twitter handle and provoke advertiser to advertise the product with the active twitter account. Before Sing-Up the account please read "Terms And Condition" of site carefully. Enjoy earnings from twitter sponsored tweets by your Twitter account - Sign-Up Here.